Yesterday was a day of indulgence. I had a huge glazed donut for breakfast, enchiladas for lunch and then fried pork chops for dinner. I regret nothing. It was all delicious. However, I don’t eat like this every day. I also indulge in healthy food. A proper balance of everything is what’s important. I am also working on new recipes for my own Spaghetti O’s®, fun party appetizers and more homemade salad dressings. If I could spend my days researching food, recipes, and cooking I’d be one happy Midgi. Alas, I cannot. Bills call, rent must be paid, and Rawr and the Captain must eat. Off to work I go with the thoughts of my next recipes ever present in the back of my mind. One recipe idea that is keeping my mind occupied is a pear and blue cheese salad. I really like pears and blue cheese, and let’s face it I need to eat more salad. But, my thought is; what if I took this salad concept and did a little twist or Midgied it (still loving that my friend made me a verb). What if I made grilled blue cheese and pear sandwiches? Why stop there? Blue cheese is a strong flavor, so maybe a full-sized cheese sandwich is a bit over the top. Why not add bacon or caramelized shallots? Or both? The possibilities are endless. What began as a twist on a traditional salad has now become assorted appetizers for a festive occasion. It is so fun to create something new from something traditional. This is what I truly enjoy about cooking. Starting with a simple idea and making it my own. The best part is getting to share my ideas, so thank you to everyone who responded to my Facebook and Twitter question of with or without bacon. The overwhelming comments of “is that even a real question?” convinced me that with bacon was the way to go. For my vegetarian friends, of whom I have many, please enjoy these delights without the bacon. Now having a clear path of what to make, I stroll the two steps from the living room to the kitchen and get to work. Because these are appetizers, I chose to get really good blue cheese, Stilton. It’s rich and pungent and goes great with red wine. The different layers of the recipe can be made ahead and assembled a day or two later. If your office has a toaster oven or something of that nature (not a microwave), then these will work perfectly for an office holiday gathering. When I told some friends I was making pear and blue cheese crostini, I must have mumbled some. Because the response was “Impaired blue cheese?” After a good laugh this new dish has a ridiculous, but memorable name. If blue cheese just really doesn’t work for you, try substituting gruyere or even goat cheese. I’d love to hear your thoughts. 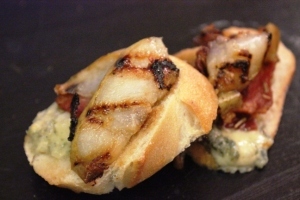 This week, I present a recipe that is easy, delicious and perfect for the holiday season: Pear and blue cheese crostini. Or, Impaired Blue Cheese Sandwiches, depending on who you’re talking to. A quick and delicious twist on the pear and blue cheese salad. And, yep, there's bacon! Preheat oven to 350o. Place bacon strips on foil lined baking sheet and sprinkle rosemary on top. Bake for 10 – 15 minutes, until almost done, but not too crisp. Remove from oven and set aside. Preheat small skillet to medium heat and melt olive oil and butter together. Place shallot slices in skillet and stir well to coat evenly. Add brown sugar and melt together, continually stirring. Reduce heat to medium low and slowly cook for about 10 – 15 minutes until shallots are soft and caramelized in color. Remove from heat and set aside. Preheat a grill pan to medium heat. Place pears on pan and quickly grill for about 2 – 3 minutes until char lines are visible. Remove from heat. Preheat oven to broil. Line second baking sheet with bread slices. 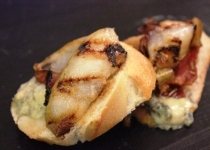 Top with large chunks of the blue cheese. Crumbles don’t hold together well, so I do recommend a wedge of cheese that you pinch and crumble yourself. Top with bacon slices, caramelized onions and pears. Toast in oven until cheese melts, approximately 3 – 5 minutes. This is great when serve with warm toasted nuts and red wine.